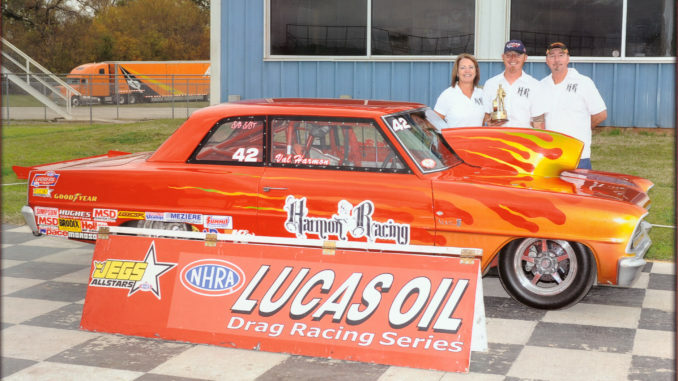 In only two short years, Luling resident Val Harmon has made a name for himself in the NHRA divisional circuit, racking up enough points to guarantee top five finishes each season. That’s quite an accomplishment considering the division has almost 400 riders and that drag racing is a complicated science that not only takes skill in driving, but also comes down to a persons’ understanding of engines and the effect weather conditions have on them. Val, 29, first got into drag racing eight years ago when his father Mark took him to Donaldsonville to watch a race. Val started racing as an amateur, and took to it so quickly that it was only a matter of time before he set his sights on the divisional circuit. “I just felt like we needed to pick up a car that was capable of winning and we had a good shot,” Val said. That ended up being the case. In Val’s first year in the NHRA, he earned enough points for a second-place finish and was nominated for rookie of the year honors. This year, he finished fifth overall. That’s impressive when you consider just how difficult it is to earn points in drag racing. First of all, every racer can take part in eight races each year. They get 30 points just for showing up, but then pick up points only by winning rounds. The first four rounds are worth 10 points each, while the final round is worth 35 points. If a racer loses in any of the rounds, they are sent home. For the Harmon family, that means sometimes driving all the way to Oklahoma only to come back after one round. “The biggest thing is getting through that first round,” Val said. “You knock the jitters out, and it’s hard when you know that if you lose you go back home. Making everything more difficult is the actual science behind drag racing. In Val’s division, each car has to be set up to finish the round in 10.90 seconds. That means that Val and his father must constantly work on their car’s engine to ensure that it complies with that speed. To do that, the two must take into account the temperature, humidity, density and altitude, among other things, in order to set a computer on the car that keeps the engine inline with the allowed speed. It also means that any change in weather throws off every calculation. “One time we were going to a race in Georgia and it rained the whole drive up there,” Mark said. “During time trials the next day, the rain had stopped, so we made our test run and got the car close to 10.90. But even though situations like that can be hard to deal with, it’s all worth it to Val. And he enjoys it even though he has had to sacrifice a lot over the last two years. However, there is one thing Val won’t miss just to continue racing.